As users demand more and more gaming performance they usually tend to neglect the importance of the power supply unit (PSU) and how essential it is to their computers. Do we need so much power? Is more power better? What about efficiency? If these are your fist thoughts when looking at power supplies, then you are on the right track. It is important to consider all these things in order to get the best power supply for you. Below I will go over examples from different brands of what to look for and what to avoid when looking at power supplies. The first thing to know when looking for a power supply is the temperature that it is rated at. Not that the manufacturers do not want you to know about it, but after having at looked at over a dozen power supplies from different brands, some of the manufacturers tend not to mention their wattage per temperature in their specifications. If this ratio is not stated, the common practice is to assume that the perfect operating temperature is between 0 C and 25 C (degrees Celsius). This means that if the power supply is rated at 500 Watts at "standard manufacturer temperature" (25C), under usual operating conditions above this temperature the power supply will actually deliver less power than advertised. The following pictures were taken from a PDF that can be found on the OCZ web site. The following specifications sheet tells us that the power supply should provide the listed power ratings from 0 C to 50 C and should provide no power at 85 C. This means that if temperature of this particular power supply increases above 50 C, the wattage that this supply is providing will decrease until it reaches 0 Watts at 85C. This information is very important if you are planning on pushing your power supply to its limits with your system or if you live in a warmer climate or conditions. An additional factor to consider while thinking about purchasing your newest power supply is its efficiency. More is not always better, in fact it is necessary to consider the system that you are going to be using in order to select the appropriate power supply. Sure your new 900 Watt power supply will be able to power your 350 Watt computer; however, it will not do so efficiently since efficiency in most power supplies usually peaks at about 50-75% of maximum load. Efficiency generally goes down as the load decreases. In fact, most power supplies will not perform as intended if the load less than 20%. In this example at maximum load the power supply will deliver 63 % to 70 % of its input. Meaning that if the computer you are using is consuming 700 Watts per hour; you are actually using 1000 Watts of power at 70% efficiency. Please also note that the power distribution in your system is very dynamic and largely depends on what you are doing with the system, your internal components, and therefore it will not always use maximum power nor will it be optimally efficient at all times regardless of what the packaging tells you. NOTE: New PSU's on the market may come premarked with an 80+ image which is a new standard to increase effeciency across a wider range of loads. Build quality of your selected power supply is also important. A power supply for a computer is like a mouth for a human, you would never want it to go bad. If your power supply fails not only will the cumputer be "starved to death", but it can transfer all the raw energy from the power jack straight into the motherboard thus instantly frying it. MTBF or Mean Time Before Failure is a good way to determine how long before death is eminent. MTBF is basically the life expectancy of your power supply, the higher the number, the better chance that your power supply will last longer. These particular power supplies, for example, are expected to last for an average of 140,000 hours if they are operating at constant temperature of 25C. Lets put this into perspective, 140,000 hours is greater than 16.5 years of expected life from this power supply. Naturally since most of the time the operating temperature will be above 25 C the life of the power supply will be also decreased. Most common MTBF of standard power supply is 100,000 hours at 25C. The power supplies presented in the example have 140,000; therefore they are expected to last longer than the norm. Please also note that even though these power supplies are rated for these time frames, it is not guaranteed that they will last that long; some may last less time while others may last longer depending on the operating conditions, temperature and a large number of other factors. These lifetimes, of course, do not include "natural disasters" such as surges, water spills, physical damage, etc. Generally under normal use conditions your power supply will likely outlive the usefulness of the PC which it is powering if the power supply is a good quality unit. While looking for a power supply you might notice that manufacturers tend to list specifications differently. Some manufacturers may list some things about a power supply while others won't. In some cases it is OK to assume some things, however, you need to understand that there is a certain risk with assumptions and it always best to call and ask more information if you are interested in a particular power supply. If you don't have time to call each and ever manufacturer you might want to make a short list of those top 5 power supplies you are considering using and searching for reviews on those models through Google. Sites like ours (Techwarelabs) often have reviews posted on power supplies in which we test and rate the power supply to give you an indicator to help your purchasing decision. 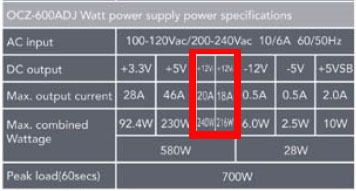 Check the power rating (Wattage) of the PSU that you are buying. Manufacturers specify the power output of their power supplies differently; some may advertise peak power, while others may advertise continuous power. For example, the PowerStram OCZ PSU in the example above is rated for 700 Watts; however, it will not be able to continuously provide 700 Watts of power. The power output of a PSU is constantly fluctuating, therefore it is allowed to peak up to 700 Watts for a short time period (less than 100 ms). The constant power output of this power supply is 600 Watts, meaning it will be able to provide 600 Watts continuously. If you are buying a power supply that has multiple 12 V rails, make sure they are separate. To comply with the ATX12V 2.x and EPS12V specifications manufacturers have to separate the rails in the PSU. If you are planning on using your power supply for playing video games with graphics cards in SLI or CrossFire configurations, this is very important to ensure a steady reliable source of power to each of your video cards. The higher scale power supplies provide more than two separate rails for all your power consumption needs. While looking at the specifications sheet of a PSU, take a look at the PFC (Power Factor Correction). The PFC will be either active or passive. PFCs are circuits built into power supplies that work to regulate the stability of the output. It is preferable to get the power supply with PFC, furthermore, it is better to get the power supply with active PFC rather than passive. The Power Factor Correction is a ratio of absorbed power over given power. Since you are running several components which cause the power consumption in a computer to constantly go up and down, it is advantageous that the Power Factor Correction ratio stays as close to 1 as possible. It is essential to choose a supply that is most suited for your needs. It is important to make sure that at all times you are covering the maximum power spikes as well as continuous power consumption. Consideration of the ambient environment is also important since it will dictate the general temperatures of your power supply thus directly influencing the power output of your supply. Power supplies should not be bought under the impression "more is better" because in some cases more is actually worse and much more costly. The best bet is to try to calculate the energy use of your system and buy a power supply that is at rated least 100 -150W higher than your normal useage.